Tony Orrico is a visual artist, performer, and choreographer whose work merges the act of drawing with choreographic gesture and bio-geometrics. 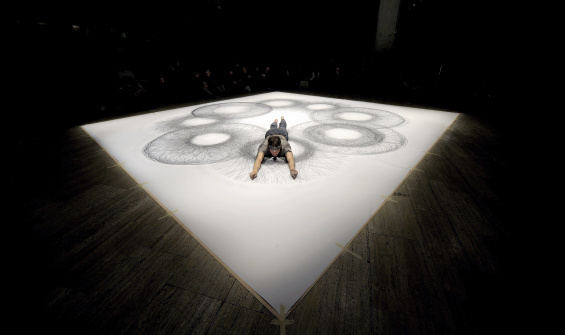 Evocative of the graphite wall drawings of Sol LeWitt, action painting, and Da Vinci’s “Vitruvian Man,” Orrico’s “Penwald Drawings” have been presented and exhibited internationally in galleries, performance venues, and public spaces. His work reflects upon the limitations and awe-inspiring possibilities of man as machine, where subtle “imperfections” in the final drawings reveal the intervention of human presence in an otherwise mathematically precise choreographic gesture. Orrico’s work is in the collection at the National Academy of Sciences and he will present a commissioned drawing at MUAC, Mexico City, in September for their permanent collection. He recently collaborated with choreographer John Jasperse on a design for Canyon, presented at BAM’s Next Wave Festival. Orrico is a former member of Trisha Brown Dance Company and Shen Wei Dance Arts, and was one of a select group of artists to re-perform the work of Marina Abramović during her retrospective at the Museum of Modern Art, New York.